The Dalai Lama received the Pacem in Terris Peace and Freedom Award on March 4 from Bishop Thomas Zinkula of the Catholic Diocese of Davenport. The Pacem in Terris award celebration will honor The Dalai Lama this year. 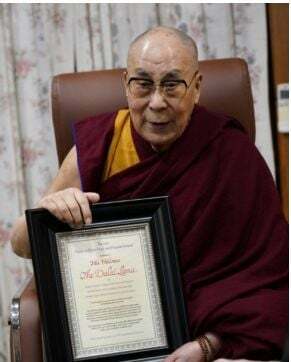 The Dalai Lama, the spiritual leader of the Tibetan people, received the Pacem in Terris Peace and Freedom Award on March 4 from Bishop Thomas Zinkula in a Buddhist temple in the foothills of the Himalayas. During the Quad-City celebration on April 9, Zinkula will reflect on the award presentation he made at the Buddhist monk’s residence in northern India. The Dalai Lama, the Nobel Peace Prize recipient of 1989, is 83 and has curtailed his travels in recent years. While it is important “to have world leaders accept the award in person so that they can share their message face to face with the people, we needed to take the opportunity to go to India to honor him,” said Kent Ferris, who leads the Pacem in Terris Coalition. Martin Luther King, Jr., Desmond Tutu and Dorothy Day are among the other internationally known recipients of the award. The Dalai Lama, who was awarded the Nobel Peace Prize, has lived in exile in Dharamsala, India, for 60 years. He fled his homeland in 1959 after the suppression of the Tibetan national uprising in Lhasa by Chinese troops. He has spent his adult life as an advocate of nonviolence and as an advocate for the Tibetan people for preservation of their culture, language, religion and well-being. The award honors St. John XXIII and commemorates his 1963 encyclical letter Pacem in Terris, which called on all people to secure peace among all nations. Coalition members are the Diocese of Davenport, The Catholic Messenger, St. Ambrose University, The Presidential Center for Faith and Learning at Augustana College in Rock Island, Churches United of the Quad-City Area, Islamic Center of the Quad-Cities, Quad-Cities Interfaith, Jewish Federation of the Quad Cities, Muslim Community of the Quad-Cities, Congregation of the Humility of Mary, Sisters of St. Benedict, Sisters of St. Francis in Dubuque, Iowa, and Sisters of St. Francis, Clinton. Rogalski Center, St. Ambrose University, 518 W. Locust St., Davenport.